"F95" redirects here. For the Düsseldorf-based football club, see Fortuna Düsseldorf. Fortran (formerly FORTRAN, derived from "Formula Translation") is a general-purpose, imperative programming language that is especially suited to numeric computation and scientific computing. Originally developed by IBM in the 1950s for scientific and engineering applications, Fortran came to dominate this area of programming early on and has been in continuous use for over half a century in computationally intensive areas such as numerical weather prediction, finite element analysis, computational fluid dynamics, computational physics, crystallography and computational chemistry. It is a popular language for high-performance computing and is used for programs that benchmark and rank the world's fastest supercomputers. The names of earlier versions of the language through FORTRAN 77 were conventionally spelled in all-capitals (FORTRAN 77 was the last version in which the use of lowercase letters in keywords was strictly non-standard). The capitalization has been dropped in referring to newer versions beginning with Fortran 90. The official language standards now refer to the language as "Fortran" rather than all-caps "FORTRAN". In late 1953, John W. Backus submitted a proposal to his superiors at IBM to develop a more practical alternative to assembly language for programming their IBM 704 mainframe computer. Backus' historic FORTRAN team consisted of programmers Richard Goldberg, Sheldon F. Best, Harlan Herrick, Peter Sheridan, Roy Nutt, Robert Nelson, Irving Ziller, Lois Haibt, and David Sayre. Its concepts included easier entry of equations into a computer, an idea developed by J. Halcombe Laning and demonstrated in the Laning and Zierler system of 1952. A draft specification for The IBM Mathematical Formula Translating System was completed by mid-1954. 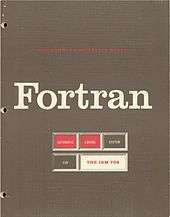 The first manual for FORTRAN appeared in October 1956, with the first FORTRAN compiler delivered in April 1957. This was the first optimizing compiler, because customers were reluctant to use a high-level programming language unless its compiler could generate code with performance comparable to that of hand-coded assembly language. While the community was skeptical that this new method could possibly outperform hand-coding, it reduced the number of programming statements necessary to operate a machine by a factor of 20, and quickly gained acceptance. John Backus said during a 1979 interview with Think, the IBM employee magazine, "Much of my work has come from being lazy. I didn't like writing programs, and so, when I was working on the IBM 701, writing programs for computing missile trajectories, I started work on a programming system to make it easier to write programs." The language was widely adopted by scientists for writing numerically intensive programs, which encouraged compiler writers to produce compilers that could generate faster and more efficient code. The inclusion of a complex number data type in the language made Fortran especially suited to technical applications such as electrical engineering. By 1960, versions of FORTRAN were available for the IBM 709, 650, 1620, and 7090 computers. Significantly, the increasing popularity of FORTRAN spurred competing computer manufacturers to provide FORTRAN compilers for their machines, so that by 1963 over 40 FORTRAN compilers existed. For these reasons, FORTRAN is considered to be the first widely used programming language supported across a variety of computer architectures. The development of FORTRAN paralleled the early evolution of compiler technology, and many advances in the theory and design of compilers were specifically motivated by the need to generate efficient code for FORTRAN programs. FREQUENCY statement (for providing optimization hints to the compiler). The fundamental unit of program is the basic block; a basic block is a stretch of program which has one entry point and one exit point. The purpose of section 4 is to prepare for section 5 a table of predecessors (PRED table) which enumerates the basic blocks and lists for every basic block each of the basic blocks which can be its immediate predecessor in flow, together with the absolute frequency of each such basic block link. This table is obtained by running the program once in Monte-Carlo fashion, in which the outcome of conditional transfers arising out of IF-type statements and computed GO TO'S is determined by a random number generator suitably weighted according to whatever FREQUENCY statements have been provided. Many years later, the FREQUENCY statement had no effect on the code, and was treated as a comment statement, since the compilers no longer did this kind of compile-time simulation. A similar fate has befallen compiler hints in several other programming languages; for example C's register keyword. Before the development of disk files, text editors and terminals, programs were most often entered on a keypunch keyboard onto 80-column punched cards, one line to a card. The resulting deck of cards would be fed into a card reader to be compiled. Punched-card codes included no lower-case letters or many special characters, and special versions of the IBM 026 keypunch were offered that would correctly print the repurposed special characters used in Fortran. Reflecting punched-card input practice, Fortran programs were originally written in a fixed-column format, with the first 72 columns read into twelve 36-bit words. 1 to 5 were the label field: a sequence of digits here was taken as a label for use in DO or control statements such as GO TO and IF, or to identify a FORMAT statement referred to in a WRITE or READ statement. Leading zeros are ignored and 0 is not a valid label number. 6 was a continuation field: a character other than a blank or a zero here caused the card to be taken as a continuation of the statement on the prior card. 7 to 72 served as the statement field. 73 to 80 were ignored (the IBM 704's card reader only used 72 columns). Columns 73 to 80 could therefore be used for identification information, such as punching a sequence number or text, which could be used to re-order cards if a stack of cards was dropped; though in practice this was reserved for stable, production programs. An IBM 519 could be used to copy a program deck and add sequence numbers. Some early compilers, e.g., the IBM 650's, had additional restrictions due to limitations on their card readers. Keypunches could be programmed to tab to column 7 and skip out after column 72. Later compilers relaxed most fixed-format restrictions, and the requirement was eliminated in the Fortran 90 standard. Within the statement field, whitespace characters (blanks) were ignored outside a text literal. This allowed omitting spaces between tokens for brevity or including spaces within identifiers for clarity. For example, AVG OF X was a valid identifier, equivalent to AVGOFX, and 101010DO101I=1,101 was a valid statement, equivalent to 10101 DO 101 I = 1, 101 because the zero in column 6 is treated as if it were a space (! ), while 101010DO101I=1.101 was instead 10101 DO101I = 1.101, the assignment of 1.101 to a variable called DO101I. Note the slight visual difference between a comma and a period. Hollerith strings, originally allowed only in FORMAT and DATA statements, were prefixed by a character count and the letter H (e.g., 26HTHIS IS ALPHANUMERIC DATA. ), allowing blanks to be retained within the character string. Miscounts were a problem. Over the next few years, FORTRAN II would also add support for the DOUBLE PRECISION and COMPLEX data types. Early FORTRAN compilers supported no recursion in subroutines. Early computer architectures supported no concept of a stack, and when they did directly support subroutine calls, the return location was often stored in one fixed location adjacent to the subroutine code, which does not permit a subroutine to be called again before a prior call of the subroutine has returned. Although not specified in Fortran 77, many F77 compilers supported recursion as an option, while it became a standard in Fortran 90. This program, for Heron's formula, reads data on a tape reel containing three 5-digit integers A, B, and C as input. If A, B, and C cannot represent the sides of a triangle in plane geometry, then the program's execution will end with an error code of "STOP 1". Otherwise, an output line will be printed showing the input values for A, B, and C, followed by the computed AREA of the triangle as a floating-point number with 2 digits after the decimal point. A FORTRAN coding form, printed on paper and intended to be used by programmers to prepare programs for punching onto cards by keypunch operators. Now obsolete. IBM also developed a FORTRAN III in 1958 that allowed for inline assembly code among other features; however, this version was never released as a product. Like the 704 FORTRAN and FORTRAN II, FORTRAN III included machine-dependent features that made code written in it unportable from machine to machine. Early versions of FORTRAN provided by other vendors suffered from the same disadvantage. FORTRAN was provided for the IBM 1401 computer by an innovative 63-phase compiler that ran entirely in its core memory of only 8000 (6-bit) characters. The compiler could be run from tape, or from a 2200-card deck; it used no further tape or disk storage. It kept the program in memory and loaded overlays that gradually transformed it, in place, into executable form, as described by Haines. and in IBM document C24-1455. The executable form was not entirely machine language; rather, floating-point arithmetic, subscripting, input/output, and function references were interpreted, anticipating UCSD Pascal P-code by two decades. IBM later provided a FORTRAN IV compiler for the 1400 series of computers, described in IBM document C24-3322. Starting in 1961, as a result of customer demands, IBM began development of a FORTRAN IV that removed the machine-dependent features of FORTRAN II (such as READ INPUT TAPE), while adding new features such as a LOGICAL data type, logical Boolean expressions and the logical IF statement as an alternative to the arithmetic IF statement. FORTRAN IV was eventually released in 1962, first for the IBM 7030 ("Stretch") computer, followed by versions for the IBM 7090, IBM 7094, and later for the IBM 1401 in 1966. By 1965, FORTRAN IV was supposed to be compliant with the standard being developed by the American Standards Association X3.4.3 FORTRAN Working Group. At about this time FORTRAN IV had started to become an important educational tool and implementations such as the University of Waterloo's WATFOR and WATFIV were created to simplify the complex compile and link processes of earlier compilers. Generic names for intrinsic functions (e.g. SQRT also accepts arguments of other types, such as COMPLEX or REAL*16 ). Hollerith constants and Hollerith data, such as GREET = 12HHELLO THERE! Control Data Corporation computers had another version of FORTRAN 77, called Minnesota FORTRAN (MNF), designed especially for student use, with variations in output constructs, special uses of COMMONs and DATA statements, optimizations code levels for compiling, and detailed error listings, extensive warning messages, and debugs. The development of a revised standard to succeed FORTRAN 77 would be repeatedly delayed as the standardization process struggled to keep up with rapid changes in computing and programming practice. In the meantime, as the "Standard FORTRAN" for nearly fifteen years, FORTRAN 77 would become the historically most important dialect. An important practical extension to FORTRAN 77 was the release of MIL-STD-1753 in 1978. This specification, developed by the U.S. Department of Defense, standardized a number of features implemented by most FORTRAN 77 compilers but not included in the ANSI FORTRAN 77 standard. These features would eventually be incorporated into the Fortran 90 standard. The IEEE 1003.9 POSIX Standard, released in 1991, provided a simple means for FORTRAN 77 programmers to issue POSIX system calls. Over 100 calls were defined in the document – allowing access to POSIX-compatible process control, signal handling, file system control, device control, procedure pointing, and stream I/O in a portable manner. Identifiers up to 31 characters in length (In the previous standard, it was only 6 characters). Ability to operate on arrays (or array sections) as a whole, thus greatly simplifying math and engineering computations. user-defined array-valued functions and array constructors. Modules, to group related procedures and data together, and make them available to other program units, including the capability to limit the accessibility to only specific parts of the module. New and enhanced intrinsic procedures. Unlike the prior revision, Fortran 90 removed no features. (Appendix B.1 says, "The list of deleted features in this standard is empty.") Any standard-conforming FORTRAN 77 program is also standard-conforming under Fortran 90, and either standard should be usable to define its behavior. A small set of features were identified as "obsolescent" and expected to be removed in a future standard. 66   GO TO 77 ; . . . IF (E) THEN ;     . . .
GO TO H . . . Fixed form source code Column 1 contains C or * or ! for comments. Clearly defined that ALLOCATABLE arrays are automatically deallocated when they go out of scope. A number of intrinsic functions were extended (for example a dim argument was added to the maxloc intrinsic). Another important supplement to Fortran 95 was the ISO technical report TR-15580: Floating-point exception handling, informally known as the IEEE TR. This specification defined support for IEEE floating-point arithmetic and floating point exception handling. which, together, compose the multi-part International Standard (ISO/IEC 1539). According to the standards developers, "the optional parts describe self-contained features which have been requested by a substantial body of users and/or implementors, but which are not deemed to be of sufficient generality for them to be required in all standard-conforming Fortran compilers." Nevertheless, if a standard-conforming Fortran does provide such options, then they "must be provided in accordance with the description of those facilities in the appropriate Part of the Standard." Fortran 2003, officially published as ISO/IEC 1539-1:2004, is a major revision introducing many new features. A comprehensive summary of the new features of Fortran 2003 is available at the Fortran Working Group (ISO/IEC JTC1/SC22/WG5) official Web site. An important supplement to Fortran 2003 was the ISO technical report TR-19767: Enhanced module facilities in Fortran. This report provided submodules, which make Fortran modules more similar to Modula-2 modules. They are similar to Ada private child subunits. This allows the specification and implementation of a module to be expressed in separate program units, which improves packaging of large libraries, allows preservation of trade secrets while publishing definitive interfaces, and prevents compilation cascades. The Final Draft international Standard (FDIS) is available as document N1830. An important supplement to Fortran 2008 is the ISO Technical Specification (TS) 29113 on Further Interoperability of Fortran with C, which has been submitted to ISO in May 2012 for approval. The specification adds support for accessing the array descriptor from C and allows ignoring the type and rank of arguments. The next revision of the language (Fortran 2015) is intended to be a minor revision and is planned for release in mid-2018. It is currently planned to include further interoperability between Fortran and C, additional parallel features, and "the removal of simple deficiencies in and discrepancies between existing facilities." Although a 1968 journal article by the authors of BASIC already described Fortran as "old-fashioned", since Fortran has been in use for many decades, there is a vast body of Fortran software in daily use throughout the scientific and engineering communities. Jay Pasachoff wrote in 1984 that "physics and astronomy students simply have to learn Fortran. So much exists in Fortran that it seems unlikely that scientists will change to Pascal, Modula-2, or whatever." In 1993, Cecil E. Leith called Fortran the "mother tongue of scientific computing" adding that its replacement by any other possible language "may remain a forlorn hope." It is the primary language for some of the most intensive supercomputing tasks, such as astronomy, weather and climate modeling, numerical linear algebra (LAPACK), numerical libraries (IMSL and NAG), structural engineering, hydrological modeling, optimization, satellite simulation and data analysis, computational fluid dynamics, computational chemistry, computational economics and computational physics. Many of the floating-point benchmarks to gauge the performance of new computer processors – such as CFP2006, the floating-point component of the SPEC CPU2006 benchmarks – are written in Fortran. On the other hand, more modern code generally uses large program libraries such as PETSc or Trilinos for linear algebra capabilities, METIS for graph partitioning, deal.II or FEniCS for mesh and finite element support, and other generic libraries. Since the late 1990s, almost all of the most widely used support libraries have been written in C and, more often, C++. Consequently, a growing fraction of scientific code is also written in these languages. For this reason, facilities for interoperation with C were added to Fortran 2003, and enhanced by ISO/IEC technical specification 29113, which will be incorporated into Fortran 2015. This shift is also evident in the selection of applications between the SPEC CPU 2000 and SPEC CPU 2006 floating point benchmarks. The precise characteristics and syntax of Fortran 95 are discussed in Fortran 95 language features. Portability was a problem in the early days because there was no agreed standard – not even IBM's reference manual – and computer companies vied to differentiate their offerings from others by providing incompatible features. Standards have improved portability. The 1966 standard provided a reference syntax and semantics, but vendors continued to provide incompatible extensions. Although careful programmers were coming to realize that use of incompatible extensions caused expensive portability problems, and were therefore using programs such as The PFORT Verifier, it was not until after the 1977 standard, when the National Bureau of Standards (now NIST) published FIPS PUB 69, that processors purchased by the U.S. Government were required to diagnose extensions of the standard. Rather than offer two processors, essentially every compiler eventually had at least an option to diagnose extensions. Incompatible extensions were not the only portability problem. For numerical calculations, it is important to take account of the characteristics of the arithmetic. This was addressed by Fox et al. in the context of the 1966 standard by the PORT library. The ideas therein became widely used, and were eventually incorporated into the 1990 standard by way of intrinsic inquiry functions. The widespread (now almost universal) adoption of the IEEE 754 standard for binary floating-point arithmetic has essentially removed this problem. Access to the computing environment (e.g., the program's command line, environment variables, textual explanation of error conditions) remained a problem until it was addressed by the 2003 standard. Large collections of library software that could be described as being loosely related to engineering and scientific calculations, such as graphics libraries, have been written in C, and therefore access to them presented a portability problem. This has been addressed by incorporation of C interoperability into the 2003 standard. It is now possible (and relatively easy) to write an entirely portable program in Fortran, even without recourse to a preprocessor. Fortran 5 was marketed by Data General Corp in the late 1970s and early 1980s, for the Nova, Eclipse, and MV line of computers. It had an optimizing compiler that was quite good for minicomputers of its time. The language most closely resembles Fortran 66. The name is a pun on the earlier Fortran IV. Fortran V was distributed by Control Data Corporation in 1968 for the CDC 6600 series. The language was based upon Fortran IV. Univac also offered a compiler for the 1100 series known as Fortran V. A spinoff of Univac Fortran V was Athena Fortran. Fortran 6 or Visual Fortran 2001 was licensed to Compaq by Microsoft. They have licensed Compaq Visual Fortran and have provided the Visual Studio 5 environment interface for Compaq v6 up to v6.1. Vendors of high-performance scientific computers (e.g., Burroughs, Control Data Corporation (CDC), Cray, Honeywell, IBM, Texas Instruments, and UNIVAC) added extensions to Fortran to take advantage of special hardware features such as instruction cache, CPU pipelines, and vector arrays. For example, one of IBM's FORTRAN compilers (H Extended IUP) had a level of optimization which reordered the machine code instructions to keep multiple internal arithmetic units busy simultaneously. Another example is CFD, a special variant of Fortran designed specifically for the ILLIAC IV supercomputer, running at NASA's Ames Research Center. IBM Research Labs also developed an extended FORTRAN-based language called VECTRAN for processing vectors and matrices. Object-Oriented Fortran was an object-oriented extension of Fortran, in which data items can be grouped into objects, which can be instantiated and executed in parallel. It was available for Sun, Iris, iPSC, and nCUBE, but is no longer supported. Such machine-specific extensions have either disappeared over time or have had elements incorporated into the main standards. The major remaining extension is OpenMP, which is a cross-platform extension for shared memory programming. One new extension, Coarray Fortran, is intended to support parallel programming. The FORTRAN system was designed for a more complex machine than the 650, and consequently some of the 32 statements found in the FORTRAN Programmer's Reference Manual are not acceptable to the FOR TRANSIT system. In addition, certain restrictions to the FORTRAN language have been added. However, none of these restrictions make a source program written for FOR TRANSIT incompatible with the FORTRAN system for the 704. Up to ten subroutines could be used in one program. FOR TRANSIT statements were limited to columns 7 through 56, only. Punched cards were used for input and output on the IBM 650. Three passes were required to translate source code to the "IT" language, then to compile the IT statements into SOAP assembly language, and finally to produce the object program, which could then be loaded into the machine to run the program (using punched cards for data input, and outputting results onto punched cards). Two versions existed for the 650s with a 2000 word memory drum: FOR TRANSIT I (S) and FOR TRANSIT II, the latter for machines equipped with indexing registers and automatic floating point decimal (bi-quinary) arithmetic. Appendix A of the manual included wiring diagrams for the IBM 533 card reader/punch control panel. Prior to FORTRAN 77, a number of preprocessors were commonly used to provide a friendlier language, with the advantage that the preprocessed code could be compiled on any machine with a standard FORTRAN compiler. These preprocessors would typically support structured programming, variable names longer than six characters, additional data types, conditional compilation, and even macro capabilities. Popular preprocessors included FLECS, iftran, MORTRAN, SFtran, S-Fortran, Ratfor, and Ratfiv. Ratfor and Ratfiv, for example, implemented a C-like language, outputting preprocessed code in standard FORTRAN 66. Despite advances in the Fortran language, preprocessors continue to be used for conditional compilation and macro substitution. One of the earliest versions of FORTRAN, introduced in the 60's, was popularly used in colleges and universities. Developed, supported, and distributed by the University of Waterloo, WATFOR was based largely on FORTRAN IV. A WATFOR student could submit their batch FORTRAN job and, if there were no syntax errors, the program would move straight to execution. This simplification allowed students to concentrate on their program's syntax and semantics, or execution logic flow, rather than dealing with submission Job Control Language (JCL), the compile/link-edit/execution successive process(es), or other complexities of the mainframe/minicomputer environment. A down side to this simplified environment was that WATFOR was not a good choice for programmers needing the expanded abilities of their host processor(s), e.g., WATFOR typically had very limited access to I/O devices. WATFOR was succeeded by WATFIV and its later versions. LRLTRAN was developed at the Lawrence Radiation Laboratory to provide support for vector arithmetic and dynamic storage, among other extensions to support systems programming. The distribution included the LTSS operating system. The Fortran-95 Standard includes an optional Part 3 which defines an optional conditional compilation capability. This capability is often referred to as "CoCo". Many Fortran compilers have integrated subsets of the C preprocessor into their systems. SIMSCRIPT is an application specific Fortran preprocessor for modeling and simulating large discrete systems. The F programming language was designed to be a clean subset of Fortran 95 that attempted to remove the redundant, unstructured, and deprecated features of Fortran, such as the EQUIVALENCE statement. F retains the array features added in Fortran 90, and removes control statements that were made obsolete by structured programming constructs added to both Fortran 77 and Fortran 90. F is described by its creators as "a compiled, structured, array programming language especially well suited to education and scientific computing." Lahey and Fujitsu teamed up to create Fortran for the Microsoft .NET Framework. Silverfrost FTN95 is also capable of creating .NET code. For more details on this topic, see Wikibooks:Fortran/Fortran examples. The following program illustrates dynamic memory allocation and array-based operations, two features introduced with Fortran 90. Particularly noteworthy is the absence of DO loops and IF/THEN statements in manipulating the array; mathematical operations are applied to the array as a whole. Also apparent is the use of descriptive variable names and general code formatting that conform with contemporary programming style. This example computes an average over data entered interactively. During the same Fortran standards committee meeting at which the name "FORTRAN 77" was chosen, a satirical technical proposal was incorporated into the official distribution bearing the title "Letter O Considered Harmful". This proposal purported to address the confusion that sometimes arises between the letter "O" and the numeral zero, by eliminating the letter from allowable variable names. However, the method proposed was to eliminate the letter from the character set entirely (thereby retaining 48 as the number of lexical characters, which the colon had increased to 49). This was considered beneficial in that it would promote structured programming, by making it impossible to use the notorious GO TO statement as before. (Troublesome FORMAT statements would also be eliminated.) It was noted that this "might invalidate some existing programs" but that most of these "probably were non-conforming, anyway". During the standards committee battle over whether the "minimum trip count" for the FORTRAN 77 DO statement should be zero (allowing no execution of the block) or one (the "plunge-ahead" DO), another facetious alternative was proposed (by Loren Meissner) to have the minimum be two – since there is no need for a loop if it is only executed once. When assumed-length arrays were being added, there was a dispute as to the appropriate character to separate upper and lower bounds. In a comment examining these arguments, Dr. Walt Brainerd penned an article entitled "Astronomy vs. Gastroenterology" because some proponents had suggested using the star or asterisk ("*"), while others favored the colon (":"). In Fortran 77, variable names beginning with the letters I–N had a default type of integer, while variables starting with any other letters defaulted to real, although programmers could override the defaults with an explicit declaration. This led to the joke: "In Fortran, GOD is REAL (unless declared INTEGER)." ↑ "FORTRAN". American Heritage Dictionary of the English Language (5 ed.). The Free Dictionary. 2011. Retrieved 2016-02-08. ↑ John Backus. "The history of FORTRAN I, II and III" (PDF). Softwarepreservation.org. Retrieved 19 November 2014. ↑ Eugene Loh (18 June 2010). "The Ideal HPC Programming Language". Queue. Association of Computing Machines. 8 (6). ↑ "HPL – A Portable Implementation of the High-Performance Linpack Benchmark for Distributed-Memory Computers". Retrieved 2015-02-21. ↑ "Softwarepreservation.org". Retrieved 22 September 2014. ↑ The Fortran I Compiler "The Fortran I compiler was the first major project in code optimization. It tackled problems of crucial importance whose general solution was an important research focus in compiler technology for several decades. Many classical techniques for compiler analysis and optimization can trace their origins and inspiration to the Fortran I compiler." ↑ "Fortran creator John Backus dies". msnbc.com. Retrieved 19 November 2014. ↑ Reference Manual, IBM 7090 Data Processing System, 1961, IBM A22-6528-3. ↑ "Fortran II User Manual" (PDF). Bitsavers.org. Retrieved 19 November 2014. ↑ "Ibibilio.org". Ibiblio.org. Retrieved 15 September 2014. ↑ Haines, L. H. (1965). "Serial compilation and the 1401 FORTRAN compiler". IBM Systems Journal. 4 (1): 73–80. doi:10.1147/sj.41.0073. This article was reprinted, edited, in both editions of Lee, John A. N. (1967). Anatomy of a Compiler. Van Nostrand Reinhold. ↑ McCracken, Daniel D. (1965). "Preface". A Guide to FORTRAN IV Programming. New York: Wiley. p. v. ISBN 0-471-58281-6. ↑ "FORTRAN Compilers and Loaders". Chilton-programming.org.uk. Retrieved 19 November 2014. ↑ Mil-std-1753. DoD Supplement to X3.9-1978. United States Government Printing Office. ↑ Posix 1003.9-1992. POSIX FORTRAN 77 Language Interface – Part 1: Binding for System Application Program Interface API. IEEE. Retrieved 19 November 2014. ↑ "Fortran Variable Declarations". Compaq Fortran. Texas, Huston, US: Compaq Computer Corporation. 1999. Retrieved 19 November 2014. The form CHARACTER*(*) is an obsolescent feature in Fortran 95. ↑ "Fortran 95 Reference". Gnu.Org. Retrieved 10 May 2014. ↑ "Fortran 2003- Last Working Draft". Gnu.Org. Retrieved 10 May 2014. ↑ "Fortran 2008 – Last Working Draft" (PDF). Gnu.Org. Retrieved 10 May 2014. ↑ "Doctor Fortran in "One Door Closes"". Software.intel.com. Retrieved 21 September 2015. ↑ "Doctor Fortran Goes Dutch: Fortran 2015". Software.intel.com. Retrieved 19 November 2014. ↑ Kemeny, John G.; Kurtz, Thomas E. (11 October 1968). "Dartmouth Time-Sharing". Science. 162: 223–228. ↑ Phillips, Lee. "Scientific computing's future: Can any coding language top a 1950s behemoth?". Ars Technica. Retrieved 8 May 2014. ↑ Pasachoff, Jay M. (April 1984). "Scientists: Fortran vs. Modula-2". BYTE (letter). p. 404. Retrieved 6 February 2015. ↑ Galperin, Boris (1993). "26". Large Eddy Simulation of Complex Engineering and Geophysical Flows. London: Cambridgey. p. 573. ISBN 0-521-43009-7. ↑ Healy, MJR (1968). "Towards FORTRAN VI". Advanced scientific Fortran by CDC. CDC. pp. 169–172. Retrieved 10 April 2009. ↑ "third party release notes for Fortran v6.1". Cs-software.com. 15 March 2011. Retrieved 19 November 2014. ↑ "F Programming Language Homepage". Fortran.com. Retrieved 19 November 2014. ↑ "Fortran for .NET Language System". ↑ "FTN95: Fortran 95 for Windows". Silverfrost.com. Retrieved 19 November 2014. ↑ "The obliteration of O", Computer Weekly, 3 March 1977. ↑ "Rules for Data Typing (FORTRAN 77 Language Reference)". docs.oracle.com. Retrieved 2016-09-29. Allen, F.E. (September 1981). "A History of Language Processor Technology in IBM" (PDF). IBM Journal of Research and Development. IBM. 25 (5). doi:10.1147/rd.255.0535. Chivers, Ian D.; Sleightholme, Jane (2013). "Compiler support for the Fortran 2003 & 2008 standards". ACM SIGPLAN Fortran Forum. ACM. 28 (1): 26–28. doi:10.1145/1520752.1520755. ISSN 1061-7264. Pigott, Diarmuid (2006). "FORTRAN – Backus et al high-level compiler (Computer Language)". The Encyclopedia of Computer Languages. Murdoch University. Archived from the original on 8 October 2009. Retrieved 5 May 2010. Roberts, Mark L.; Griffiths, Peter D. (1985). "Design Considerations for IBM Personal Computer Professional FORTRAN, an Optimizing Compiler" (PDF). IBM Systems Journal. IBM. 24 (1): 49–60. doi:10.1147/sj.241.0049. Ansi x3.9-1966. USA Standard FORTRAN (PDF). American National Standards Institute. Informally known as FORTRAN 66. Ansi x3.9-1978. American National Standard – Programming Language FORTRAN. American National Standards Institute. Also known as ISO 1539-1980, informally known as FORTRAN 77. ANSI X3.198-1992 (R1997) / ISO/IEC 1539:1991. American National Standard – Programming Language Fortran Extended. American National Standards Institute / ISO/IEC. Informally known as Fortran 90. ISO/IEC 1539-1:1997. Information technology – Programming languages – Fortran – Part 1: Base language (PDF). Informally known as Fortran 95. There are a further two parts to this standard. Part 1 has been formally adopted by ANSI. ISO/IEC 1539-1:2004. Information technology – Programming languages – Fortran – Part 1: Base language (PDF). Informally known as Fortran 2003. ISO/IEC 1539-1:2010 (Final Draft International Standard). Information technology – Programming languages – Fortran – Part 1: Base language (PDF). Informally known as Fortran 2008. Kneis, Wilfried (October 1981). "Draft standard Industrial Real-Time FORTRAN". ACM SIGPLAN Notices. ACM Press. 16 (7): 45–60. doi:10.1145/947864.947868. ISSN 0362-1340. ISO 8651-1:1988 Information processing systems – Computer graphics – Graphical Kernel System (GKS) language bindings – Part 1: FORTRAN. Geneva, Switzerland: ISO. 1988. ECMA Standard on FORTRAN (PDF). European Computer Manufacturers Association. April 1965. Retrieved 2014-11-17. FORTRAN 77 4.0 Reference Manual (PDF). Sun Microsystems, Inc. 1995. Retrieved 2014-11-17. "FORTRAN Coding Form" (PDF). IBM. Retrieved 2014-11-17. IBM System/360 and System/370 Fortran IV Language (PDF). International Business Machines. May 1974. Retrieved 2014-11-17. Goerz, Michael (2014). "Modern Fortran Reference Card" (PDF). Retrieved 2014-12-14. Adams, Jeanne C.; Brainerd, Walter S.; Hendrickson, Richard A.; Maine, Richard E.; Martin, Jeanne T.; Smith, Brian T. (2009). The Fortran 2003 Handbook (1st ed.). Springer. ISBN 978-1-84628-378-9. Akin, Ed (2003). Object Oriented Programming via Fortran 90/95 (1st ed.). Cambridge University Press. ISBN 0-521-52408-3. Chapman, Stephen J. (2007). Fortran 95/2003 for Scientists and Engineers (3rd ed.). McGraw-Hill. ISBN 978-0-07-319157-7. Chivers, Ian; Sleightholme, Jane (2015). Introduction to Programming with Fortran (3rd ed.). Springer. ISBN 978-3-319-17700-7. Etter, D. M. (1990). Structured FORTRAN 77 for Engineers and Scientists (3rd ed.). The Benjamin/Cummings Publishing Company, Inc. ISBN 0-8053-0051-1. Ellis, T. M. R.; Phillips, Ivor R.; Lahey, Thomas M. (1994). Fortran 90 Programming (1st ed.). Addison Wesley. ISBN 0-201-54446-6. Kupferschmid, Michael (2002). Classical Fortran: Programming for Engineering and Scientific Applications. Marcel Dekker (CRC Press). ISBN 0-8247-0802-4. McCracken, Daniel D. (1961). A Guide to FORTRAN Programming. New York: Wiley. LCCN 61016618. Metcalf, Michael; John Reid; Malcolm Cohen (2011). Modern Fortran Explained. Oxford University Press. ISBN 0-19-960142-9. Nyhoff, Larry; Sanford Leestma (1995). FORTRAN 77 for Engineers and Scientists with an Introduction to Fortran 90 (4th ed.). Prentice Hall. ISBN 0-13-363003-X. Page, Clive G. (1988). Professional Programmer's Guide to Fortran77 (7 June 2005 ed.). London: Pitman. ISBN 0-273-02856-1. Retrieved 4 May 2010. Press, William H. (1996). Numerical Recipes in Fortran 90: The Art of Parallel Scientific Computing. Cambridge, UK: Cambridge University Press. ISBN 0-521-57439-0. Sleighthome, Jane; Chivers, Ian David (1990). Interactive Fortran 77: A Hands-On Approach. Computers and their applications (2nd ed.). Chichester: E. Horwood. ISBN 0-13-466764-6.